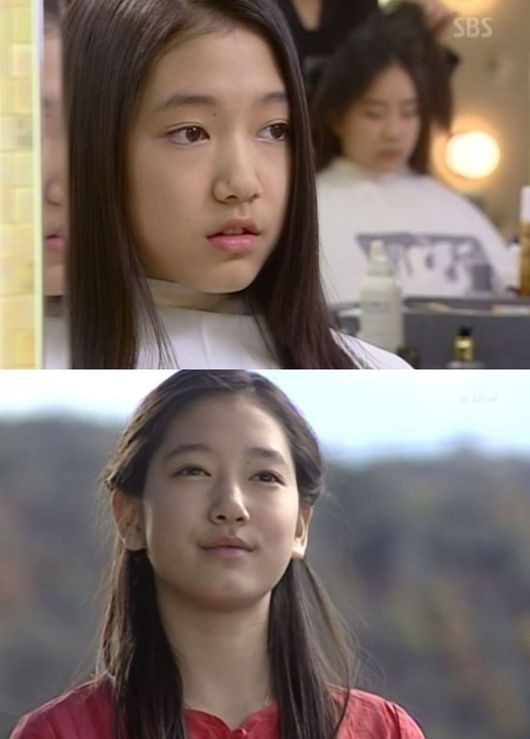 Actress Park Shin-hye has taken on a wide range of acting roles over the past 14 years, emerging as a favorite both on TV and the big screen. Despite what she has accomplished so far, the biggest concern of the 27-year-old remains her career. She recently told the media that she consistently works to improve her acting and seeks new challenges. Her diligence since she was a teenager seems to be one of the reasons behind her success. Park made her first public appearance in a music video of singer Lee Seung-hwan’s “Flower” in 2003. In the video, the 13-year-old Park appears as a sporty young girl wearing vibrant, colorful outfits and big goggles. In 2003, Park also shot to stardom as a teen actress by playing the childhood years of lead actress Choi Ji-woo’s character in the SBS TV series “Stairway to Heaven.” She showed impressive acting in the series, but Park recently revealed that playing the role of a young girl in love was challenging at the time. In 2007, Park starred in the horror film “Evil Twin,” where she played the two roles of onscreen twin sisters So-yeon and Hyo-jin. At age 18, Park went on hiatus, but returned with the SBS hit series “You’re Beautiful” in 2009. Since then, Park has been boasting an impressive portfolio. She played lead roles in tvN’s “Flower Boys Next Door” and SBS’ “The Heirs” -- both in 2013 -- and SBS’ “Pinocchio” from 2014 to 2015. Park stars in the courtroom film “Heart Blackened,” which premiered on Nov. 2.